The beauty of trees has been revered by mankind for countless millenia. While they are an instrumental part of the Earth’s ecosystem, they are also symbols of beauty and a singular representation of nature as a whole. 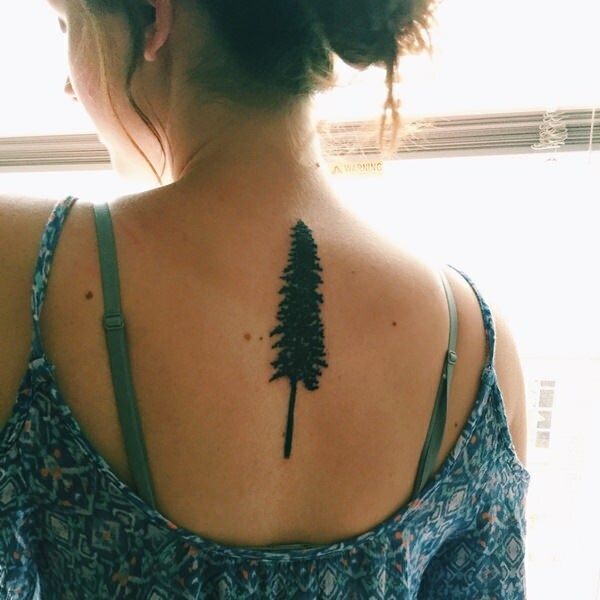 In this article we will see forty five tree tattoos that illustrate the inseparable connection between human beings and the trees that surround us. While I suspect that this isn’t a tattoo but a drawing done with a ballpoint pen. The piece depicts a weathered old tree with a hole or tree hollow in the center. 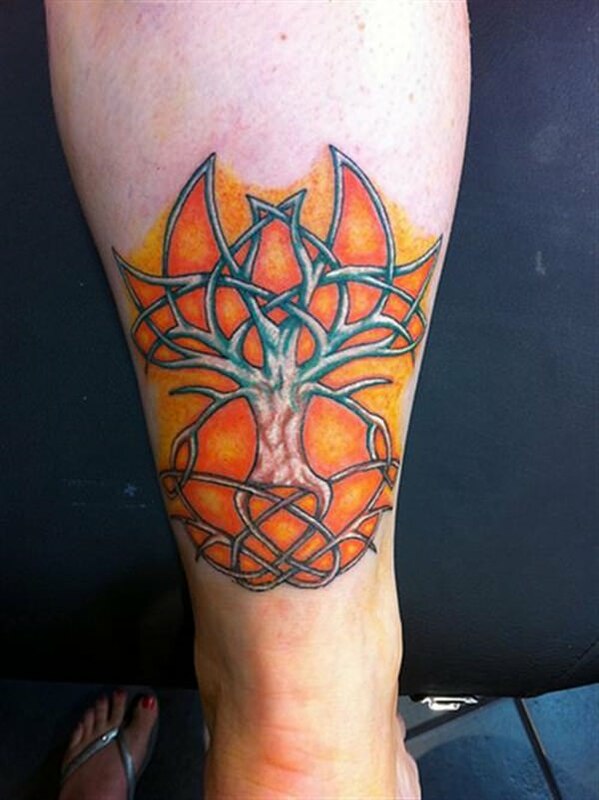 This tattoo, relying heavily on an orange color palette, shows a tree with branches and roots that intertwine in patterns indicative of traditional Celtic imagery. 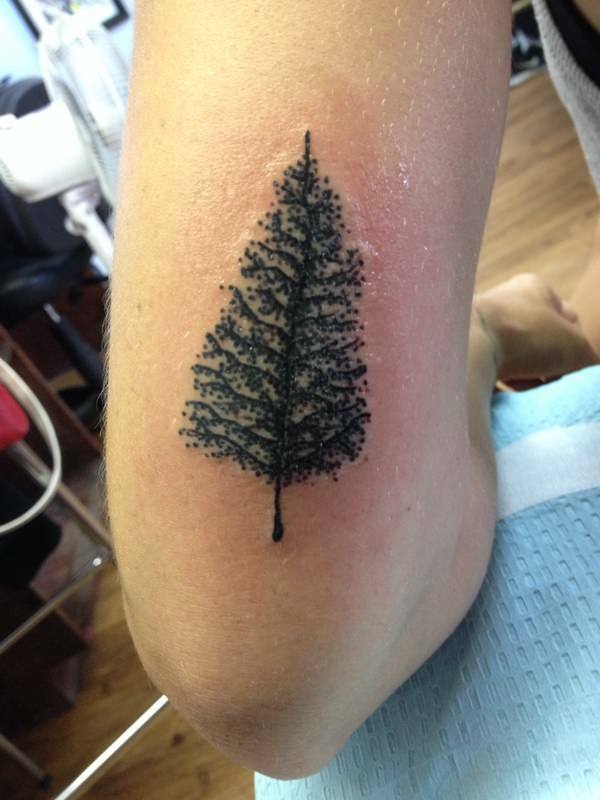 An all-black silhouette of a leafless tree is located on the wearer’s wrist in this tattoo. 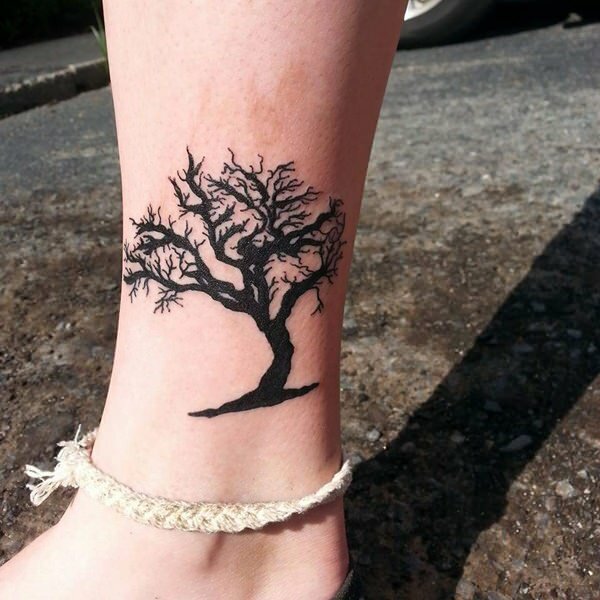 An intensely black silhouette depicts a leafless tree with a crooked trunk on the wearer’s ankle in this tattoo. 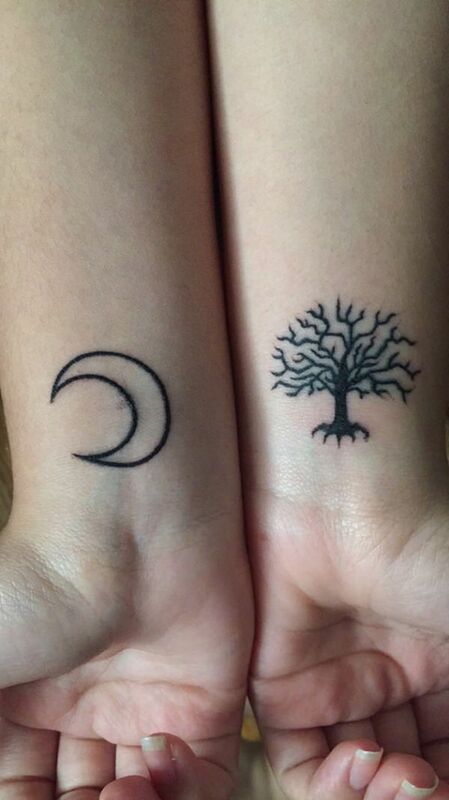 A simplified depiction of a crescent moon and a barren tree are inked on the wearer’s wrists in this tattoo set. An ovular vignette encapsulates the silhouettes of trees in a forest while a flock of birds rests upon the branches of the tree in the foreground. 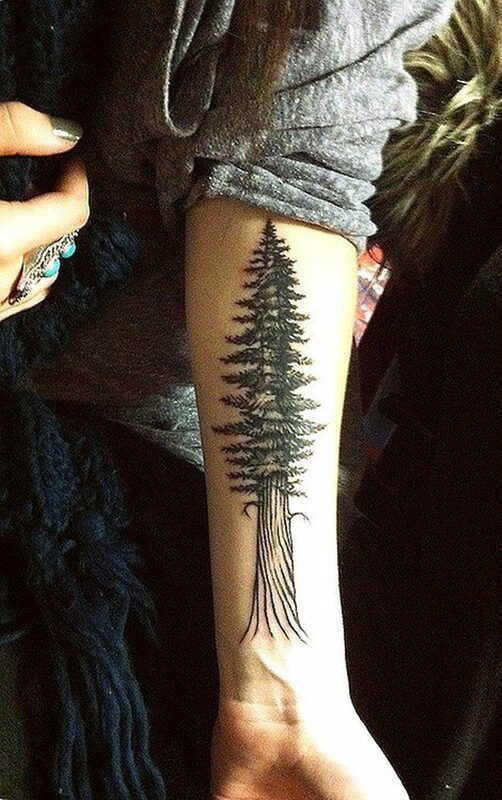 A tree, resembling a pine tree, has no branches on the lower half of the trunk in this black and gray forearm piece. A scraggly tree trunk lightly colored with brown accents ascends up the right side of the wearer’s back and down the wearer’s right arm. The tree has some erratically dispersed branches that support individual leaves colored with an intense shade of green. Undeniably precise line-work composes the silhouette of a leafless tree near the wearer’s left hip bone. 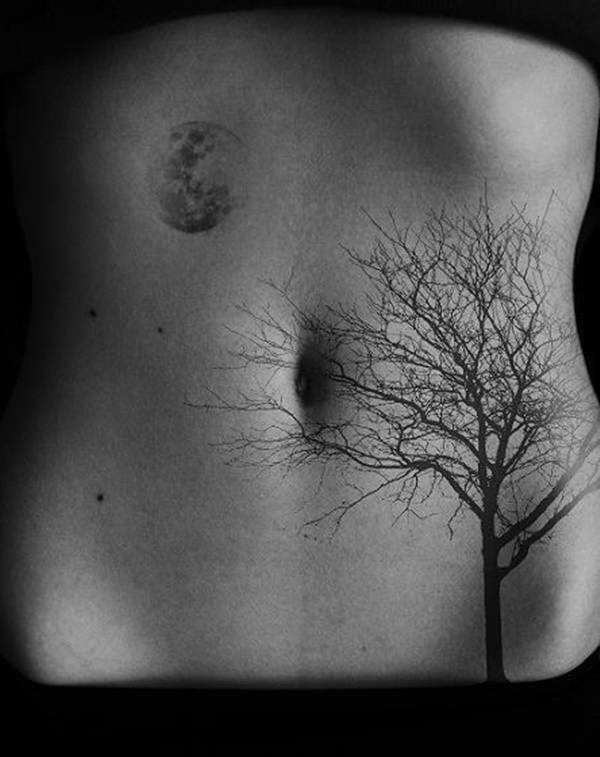 While a realistic depiction of a moon is pictured on the wearer’s stomach just below the left side of the wearer’s rib cage. A small, black silhouette of a palm tree is depicted on the wearer’s right thigh in this simple tattoo. 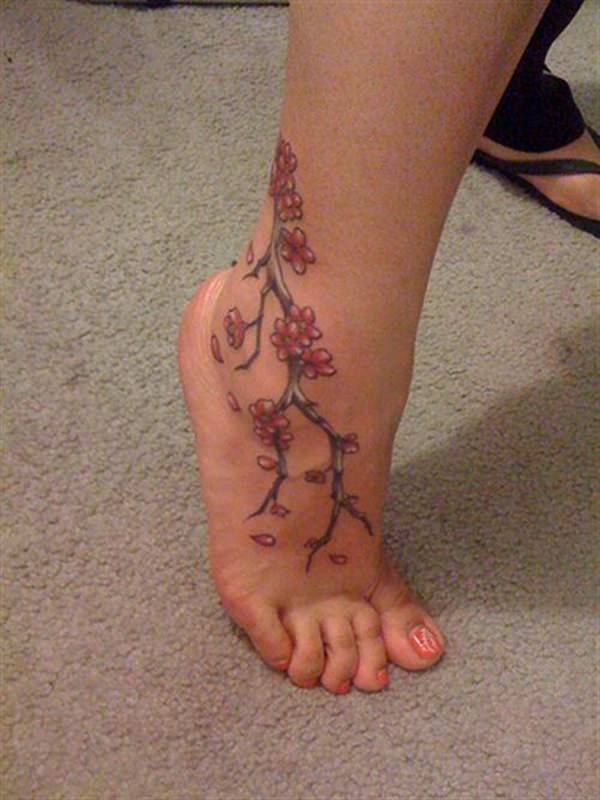 The branch of a cherry tree adorns the wearer’s ankle and foot in this tattoo. The branch supports a series of pink cherry blossoms and both the blossoms and the branch are accented with white ink to add a sense of complexity to the piece. 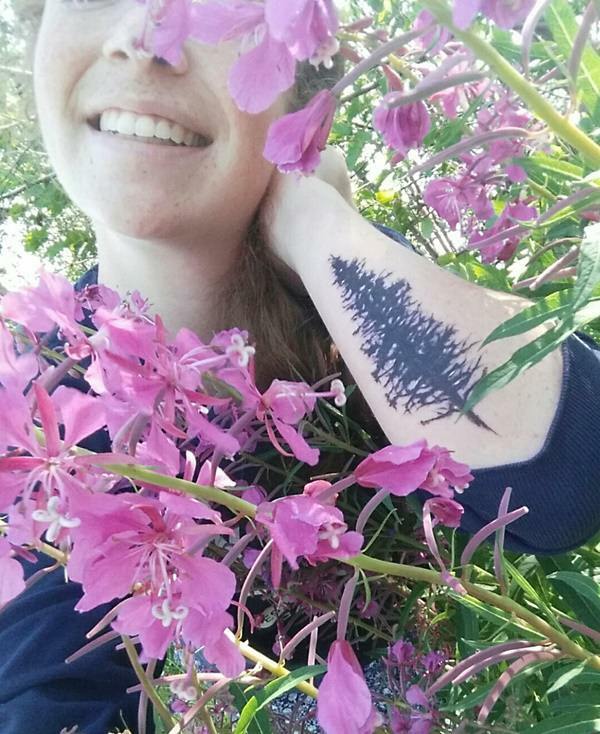 This tattoo, located on the wearer’s forearm, depicts an abstract silhouette of a pine tree. The line-work is intentionally imprecise to create the effect of watercolor paint where the imagery is artfully blurry. 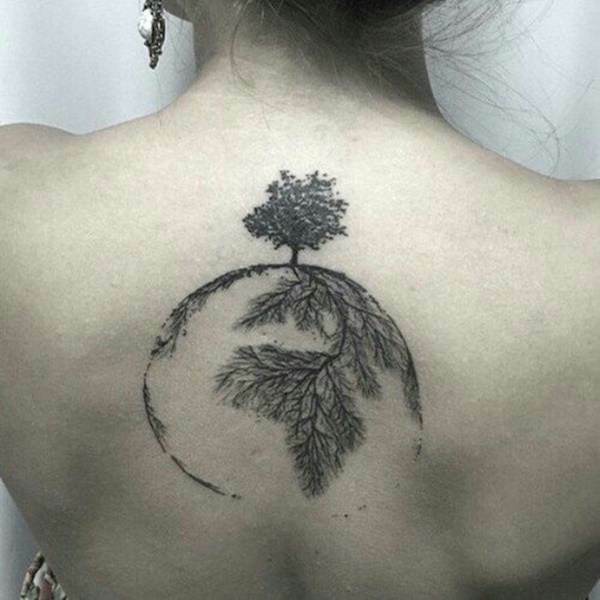 This black and gray tattoo depicts a tree growing at the North Pole while the roots of the tree run into the earth and create the continents. 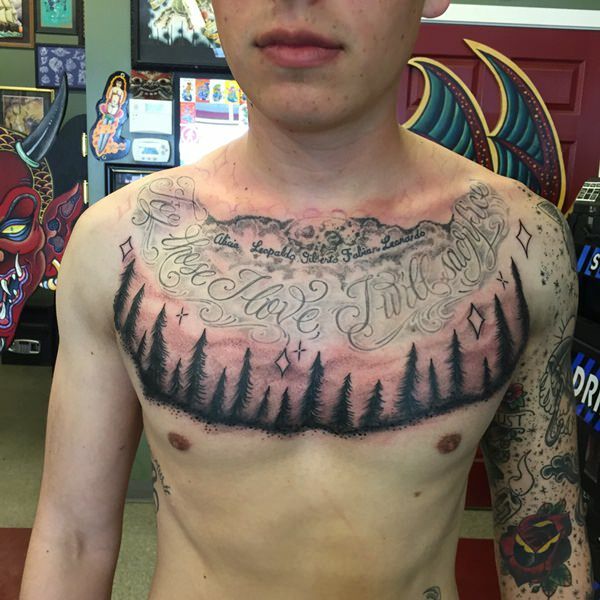 The tattoo is located about three inches below the base of the wearer’s neck. This black and gray tattoo depicts a branch of a cherry tree adorned with cherry blossoms running up the left side of the wearer’s back. 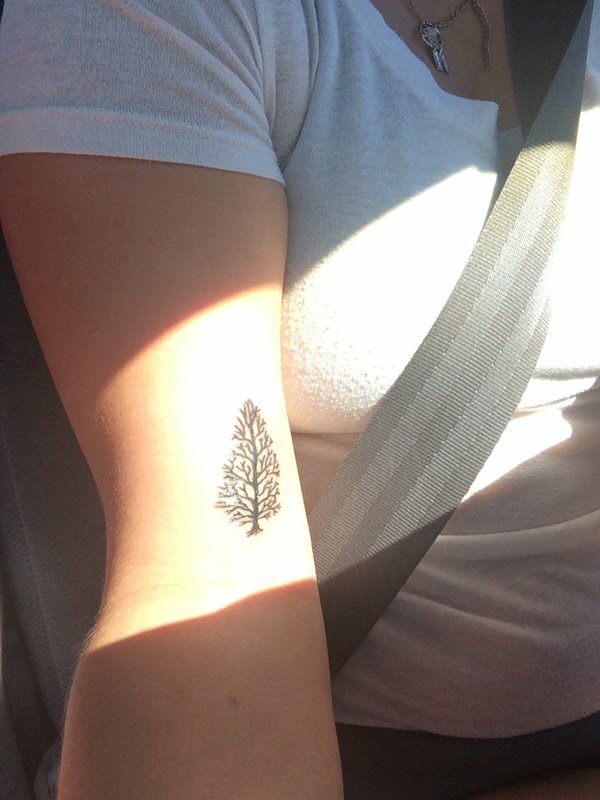 This black and gray tattoo, pictured on the wearer’s bicep, depicts a stylized oak tree with a knurled trunk, roots, and branches. 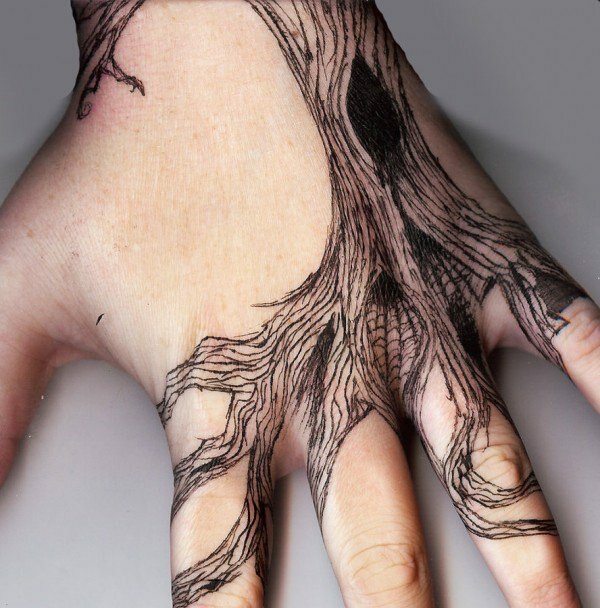 This black silhouette pictures the branches of the tree creeping down onto the wearer’s forearm. 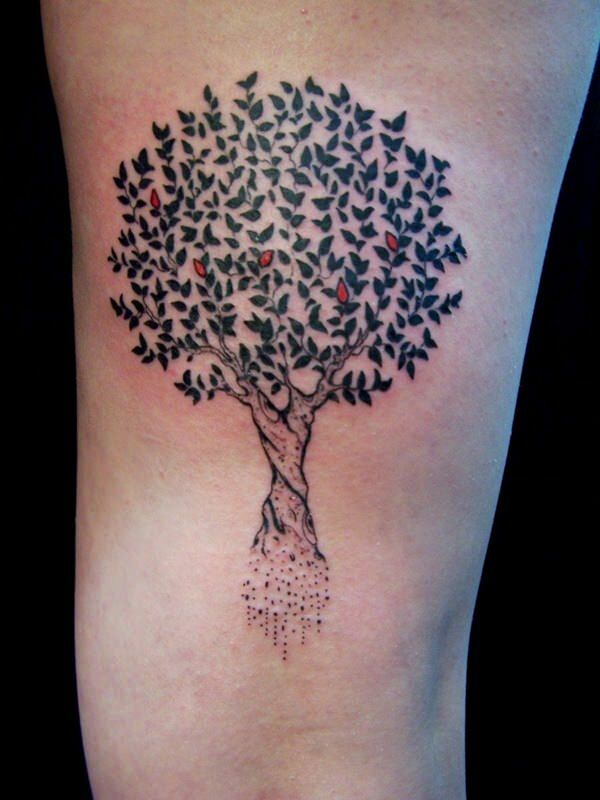 This stylized tattoo focuses on a black tree with a twisted trunk, five red leaves dispersed throughout the branches, and roots disintegrating into a series of dots. 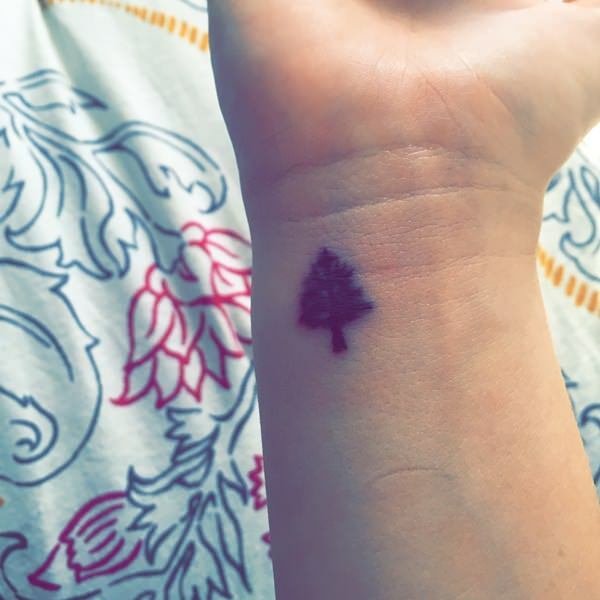 This tattoo, inked on the back of the wearer’s arm near the tricep, illustrates the black silhouette of a sparsely needled pine tree. 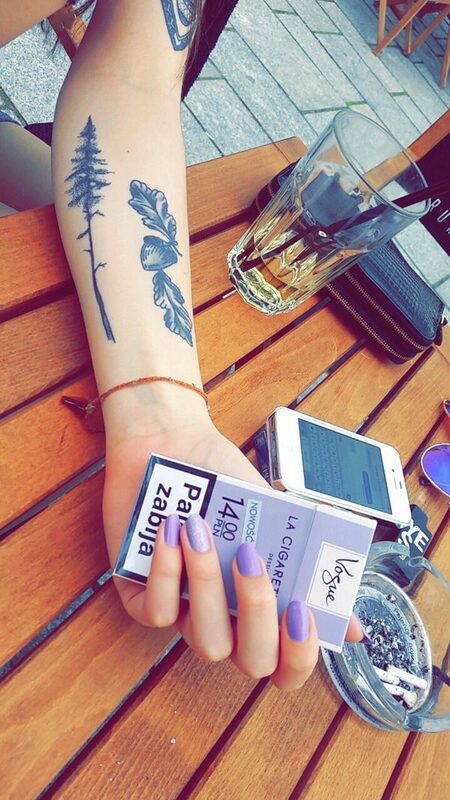 A pine tree is depicted in black ink on the wearer’s forearm. 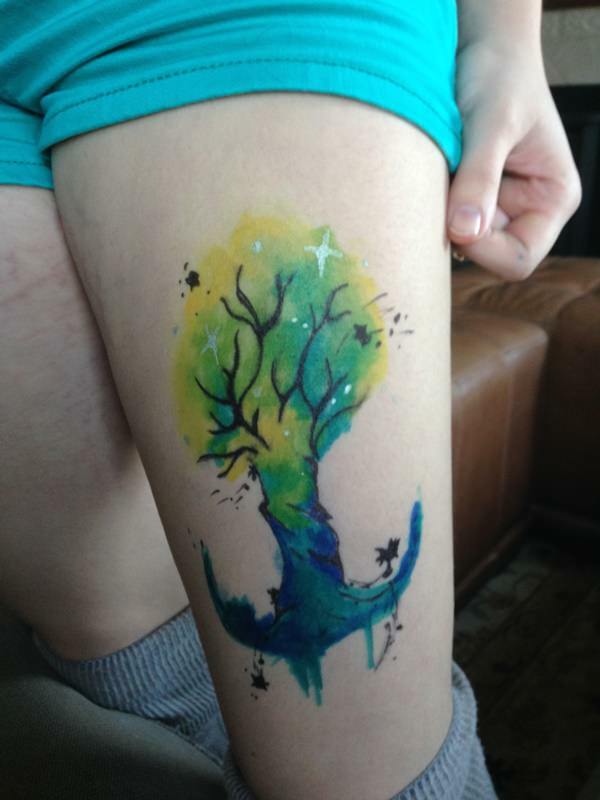 The tattoo pictures the tree with an absurdly long trunk intermittently accented with small, broken branches. 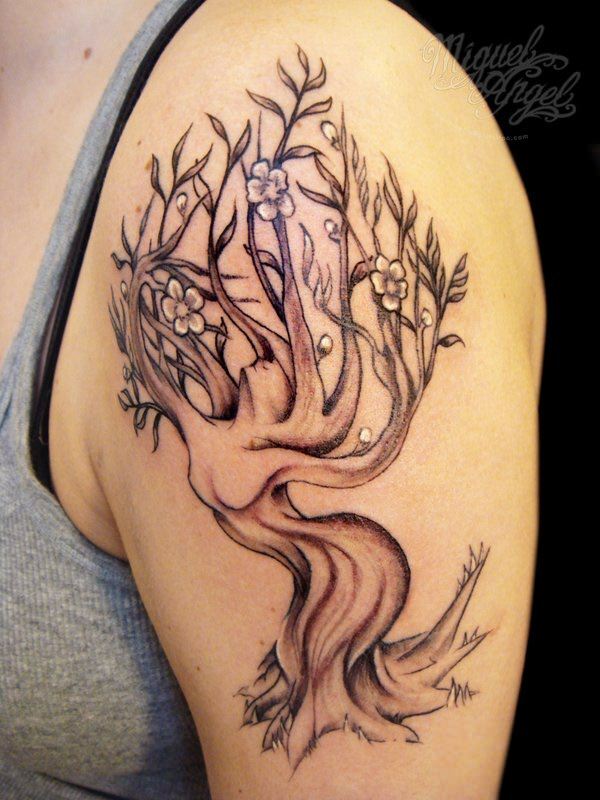 A stylized tree with no leaves is created using black ink and located on the wearer’s forearm in this tattoo. 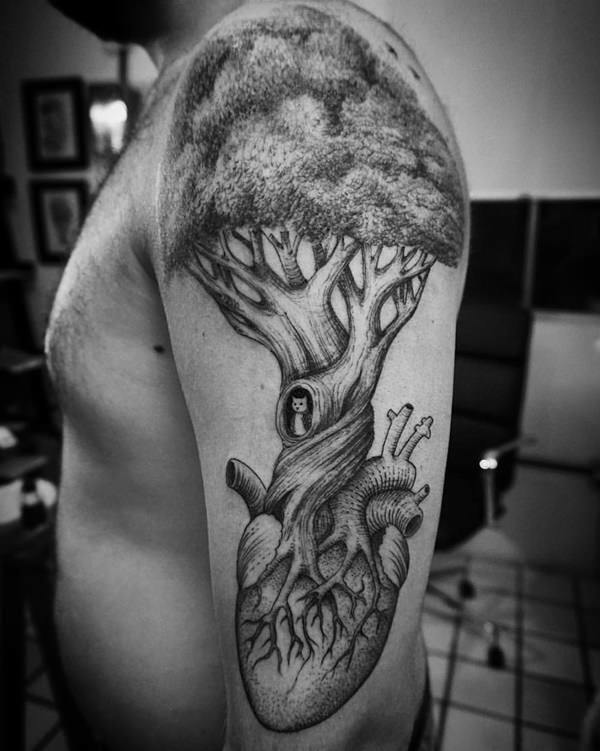 This imaginative black and gray tattoo replaces the roots of a tree with an anatomically correct heart. The tree has a twisted trunk with a hollow in the center and inside of the hollow sits a house cat. A series of dots is used to create a 3D effect and add texture to the foliage at the top of the image. A palette of blue, green, and yellow is used to create this vivid watercolor depiction of a barren tree with stars twinkling overhead. 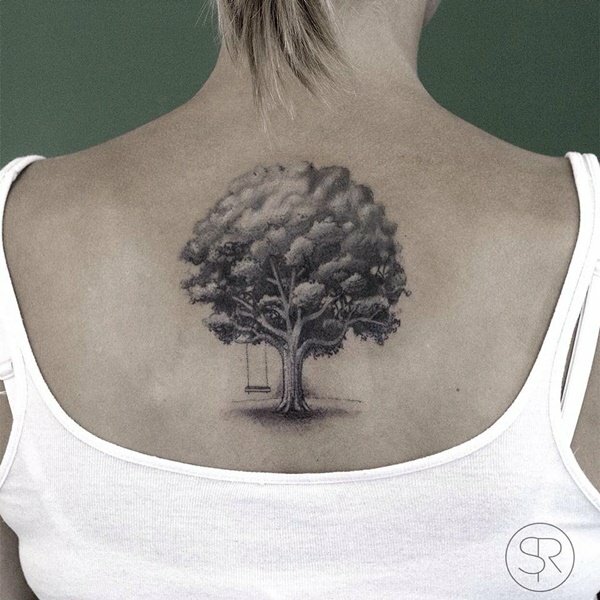 A picturesque interpretation of a tree with a rope swing is inked in the center of the wearer’s back between the shoulder blades. This doesn’t look like a tree to me. This is more reminiscent of an unkempt bush. 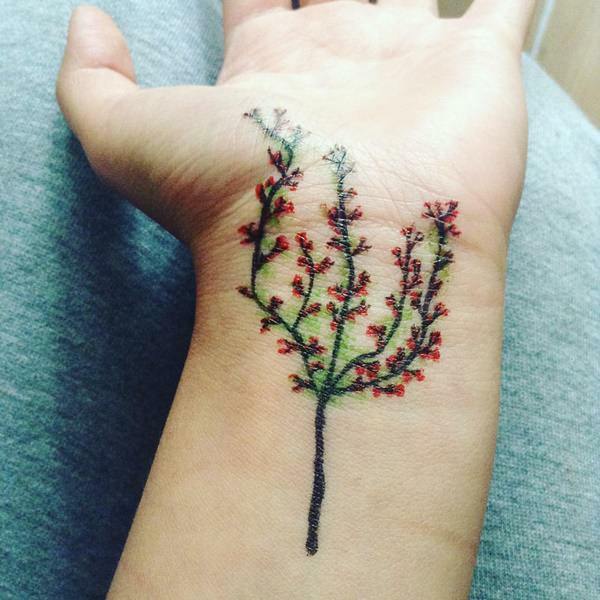 Created using black ink for the trunk and branches; the piece is adorned with red and green leaves. The piece starts on the wearer’s wrist and ascends onto the wearer’s palm. 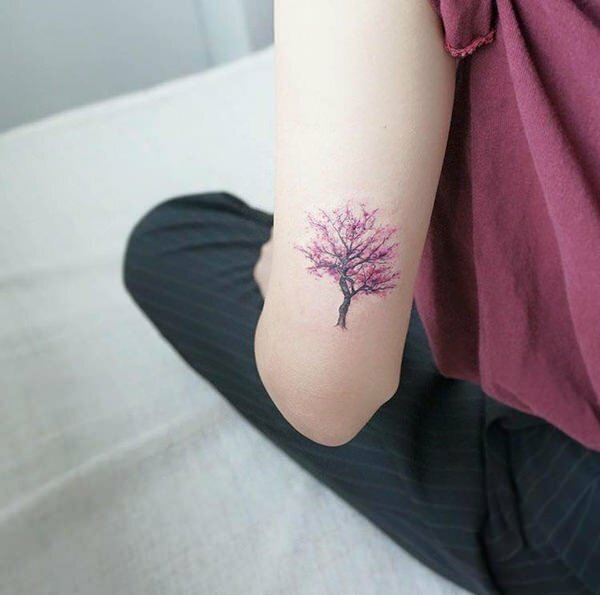 A tree adorned with pink leaves is located on the back of the wearer’s left arm in this tattoo. 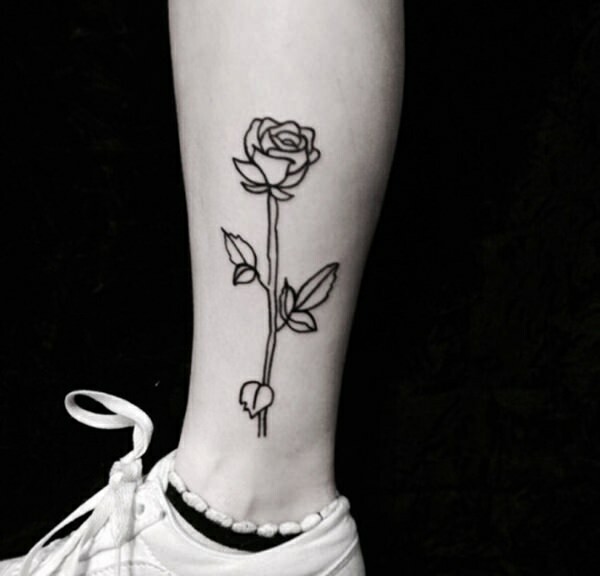 The black outline of a rose, which is not a tree, is pictured on the wearer’s shin. The piece starts just above the ankle bone and stops about halfway up the calf. A cartoonish portrait of a tree is depicted inside of an ornate frame. 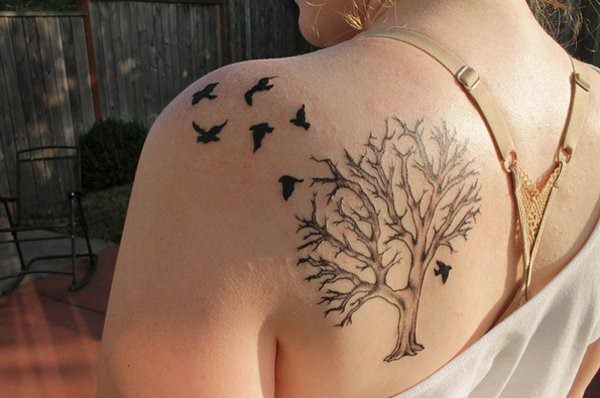 The piece consists entirely of black ink and is located on the upper left side of the wearer’s back. 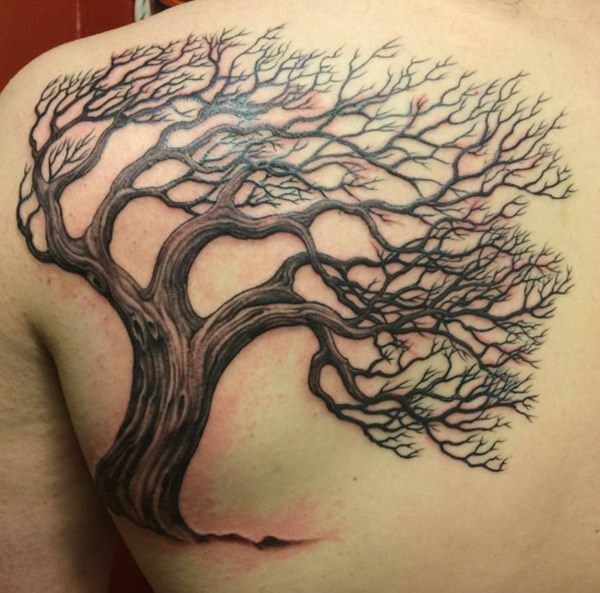 Located on the left side of the wearer’s back; this tattoo depicts a black and gray tree with its branches windswept to the right of the trunk. 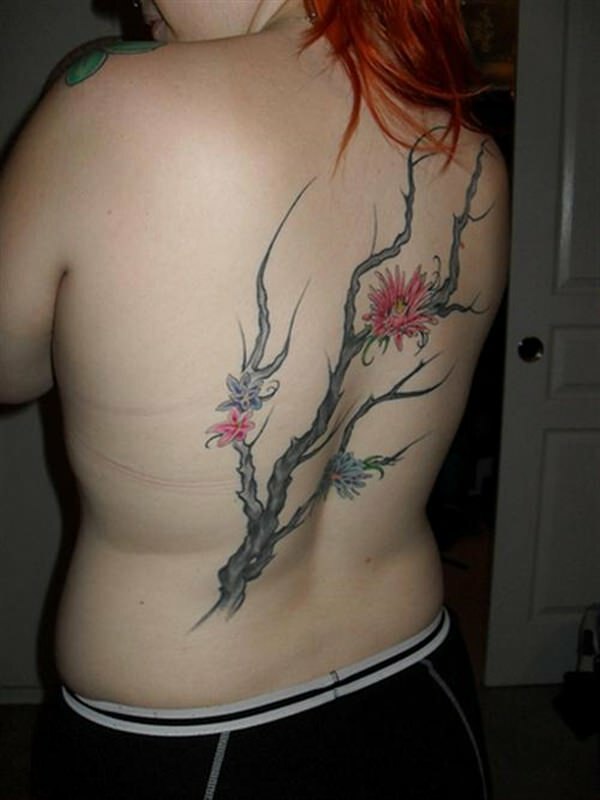 This tattoo, that stretches from the lower left side to the upper right side of the wearer’s back, depicts a black and gray branch accented with two blue and two pink flowers. Impeccable coloring makes this piece an exceptional tattoo. 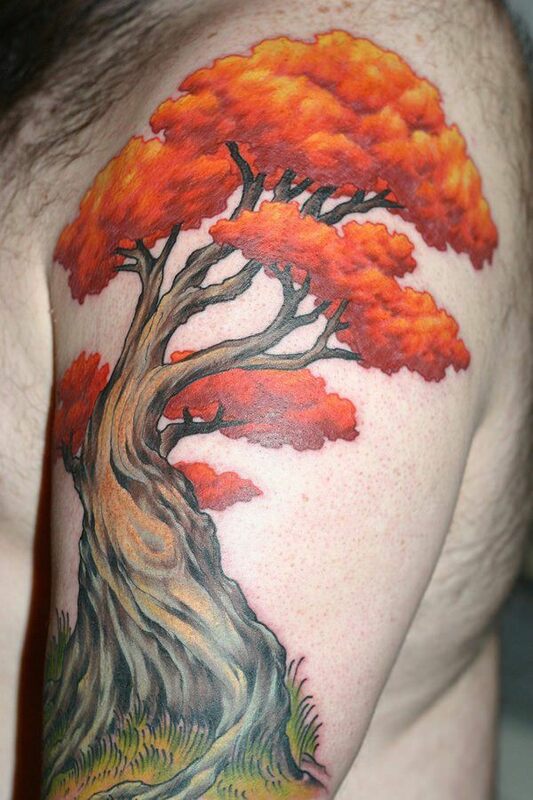 Located on the wearer’s left bicep the trunk of the tree is colored using black, gray, and varying shades of brown. Meanwhile, the canopy of the tree is colored using a vibrant palette of reds, oranges, and yellows. The figure of a woman comprises the trunk of the tree in this black and gray tattoo located on the wearer’s left bicep. 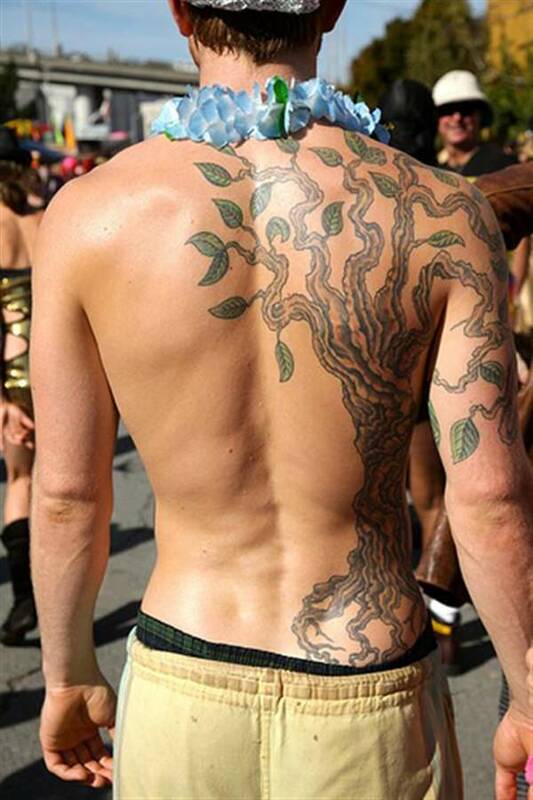 The tattoo utilizes white ink to accentuate the flowers throughout the foliage and add contrast to the piece. A black and gray tree surrounded by a pile of skulls starts at the wearer’s stomach and travels up the torso, stopping just below the wearer’s chin. 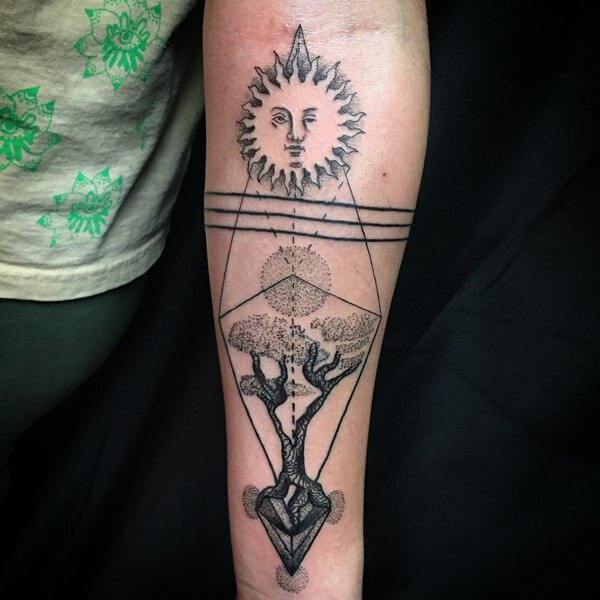 This tattoo may be a reference to Dante’s Inferno where Dante said that one level of hell contained trees with roots made of up of the souls of the damned. 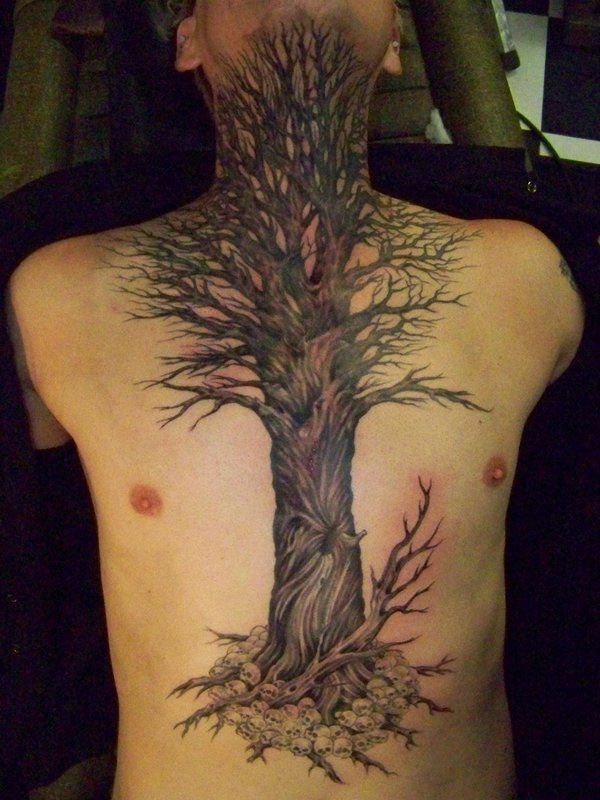 This black and gray back piece shows a headless feminine figure composing the trunk of a tree with gnarled roots and branches. The piece starts at the wearer’s lower back and travels up the back ending at the wearer’s shoulders. 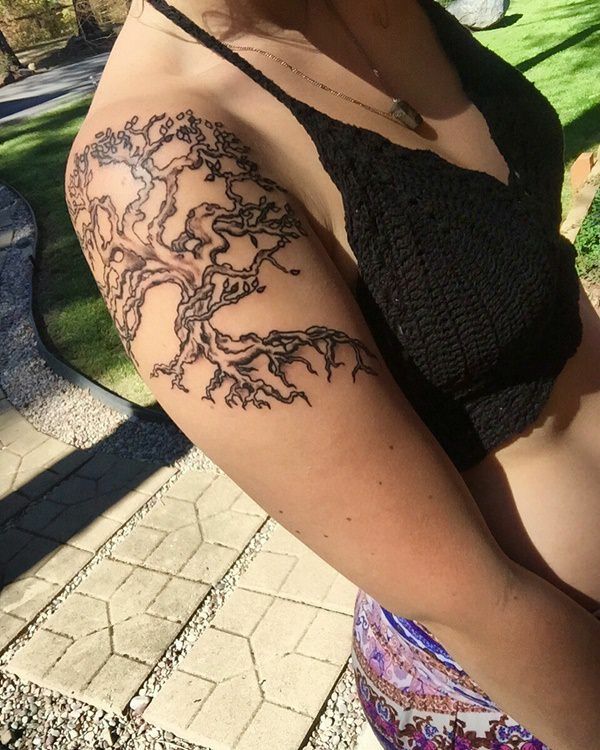 This unique tattoo shows a tree with a trunk shaped like an embracing couple while butterflies swarm the branches and fruit lays on the ground around the roots. 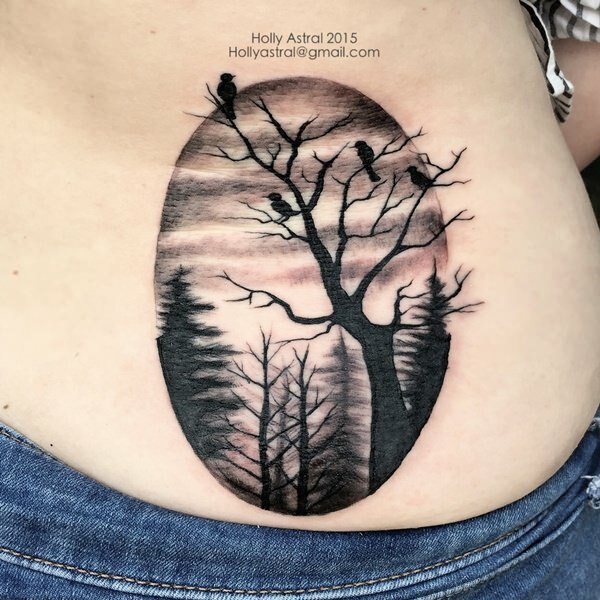 A black and gray tree is surrounded by black bird silhouettes in this tattoo that’s located on the wearer’s left shoulder blade. 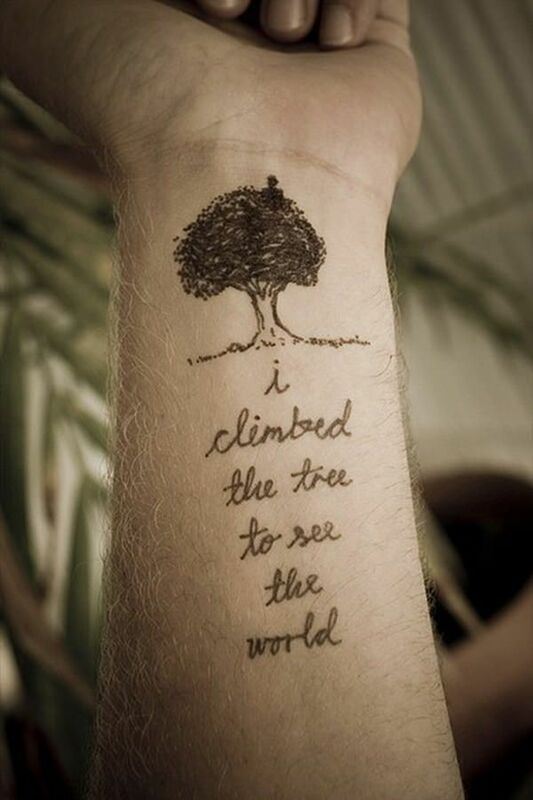 The silhouette of a man sitting atop a tree is pictured above a quote reading, “I climbed the tree to see the world,” in cursive font. Stylized black and gray depictions of the sun and a tree overlap a diamond shaped, geometric design. The tree and a ball located above the tree are created using a series of overlapping dots while other parts of the design are created using bold, black lines to create contrast. 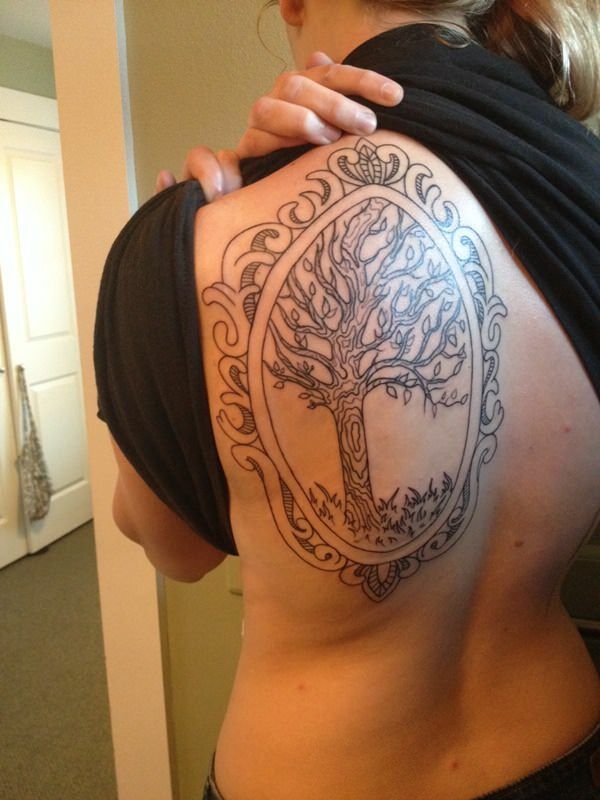 A forestscape is pictured in black ink across the width of the wearer’s chest. Above the trees the piece is embellished with a a couple diamond shaped stars. A black pine tree is pictured running along the wearer’s spine from the base of the wearer’s neck and ending just below the shoulder blades. 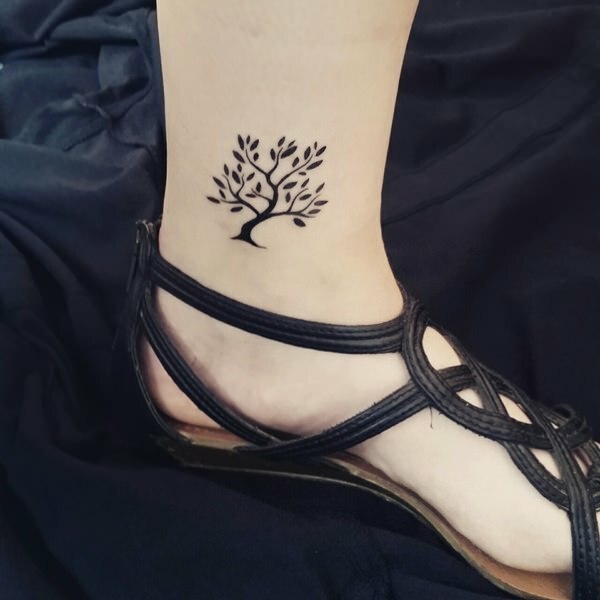 A small, hyper-stylized tree is depicted in black ink on the inside of the wearer’s left ankle in this tattoo. 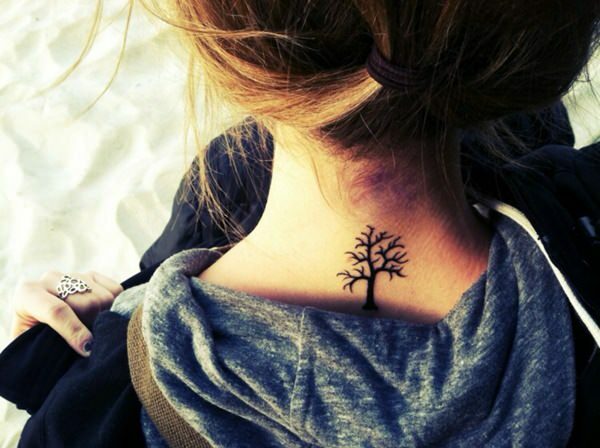 A barren tree is depicted in black ink at the base of the wearer’s neck in this simple tattoo. 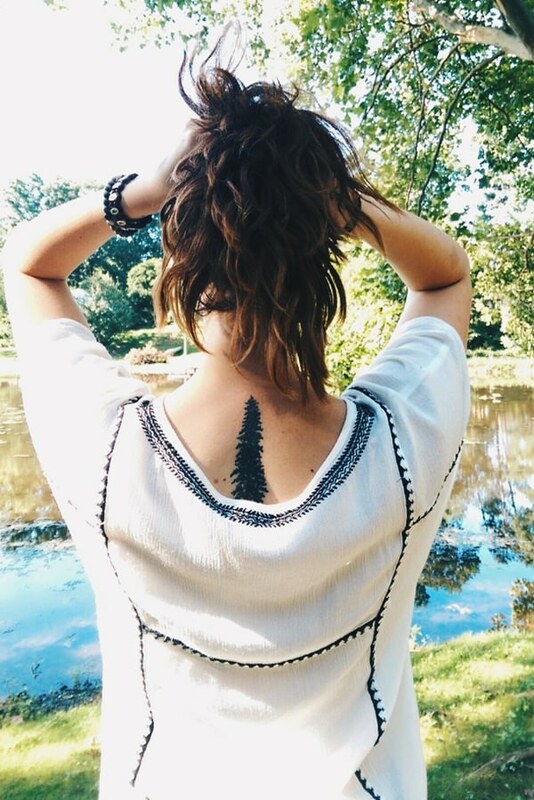 Another rendition of a black pine tree that runs along the wearer’s spine and stops just below the base of the wearer’s neck. 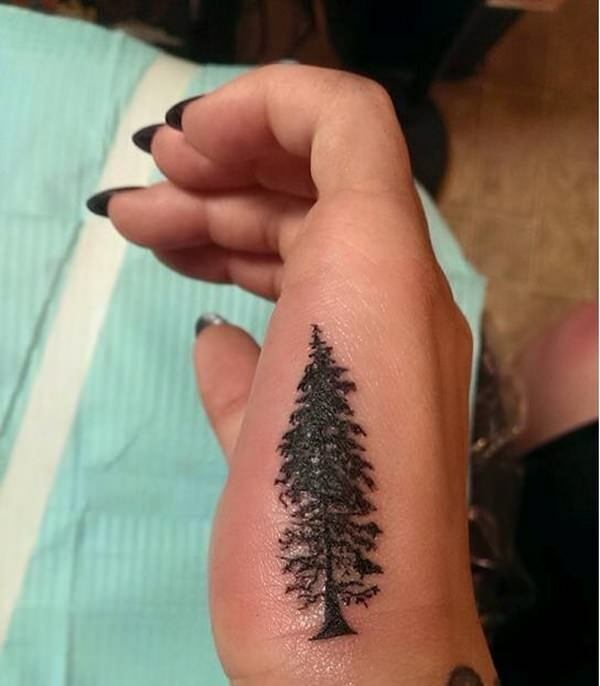 This tattoo depicts a black pine tree on the underside of the wearer’s left hand. 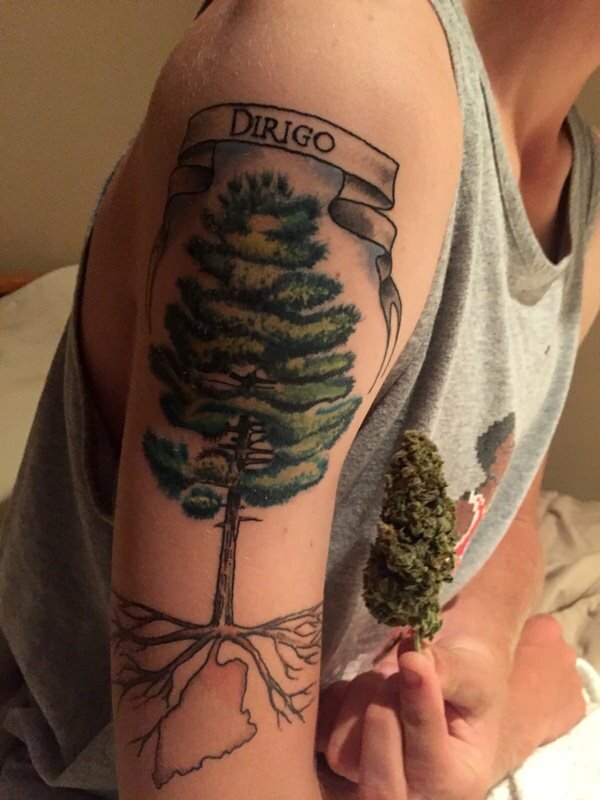 “Dirigo,” is the state seal of Maine and is Latin for “I direct,” or “I lead.” Underneath the banner reading, “Dirigo,” is a tree with roots that create the outline of the state of Maine. 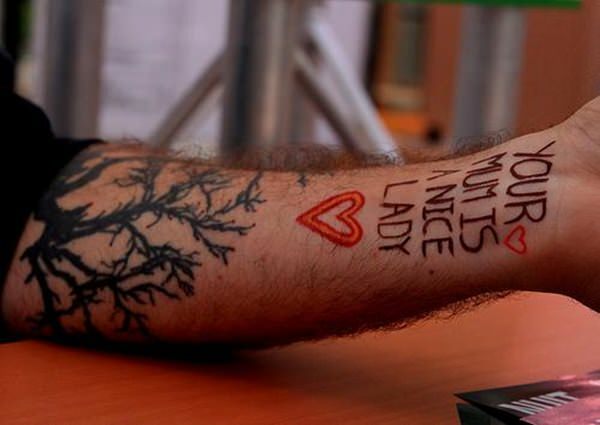 Another notable part of this picture is the Marijuana bud the wearer is holding up next to their tattoo. While I can’t see any relation between the tattoo and Marijuana, I can only assume that the wearer was excited to show off their love for their home state and weed in a single photo. 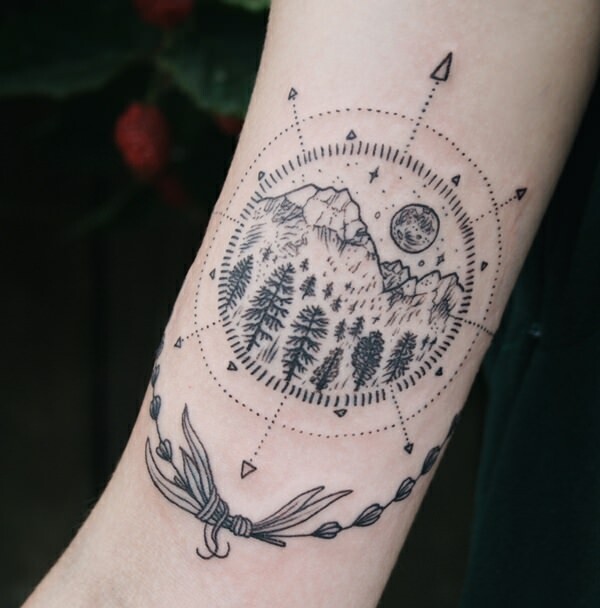 A vignette is framed with a series of geometric shapes including dots and triangles and pictures a simplified landscape complete with trees, mountains, the moon, and stars. 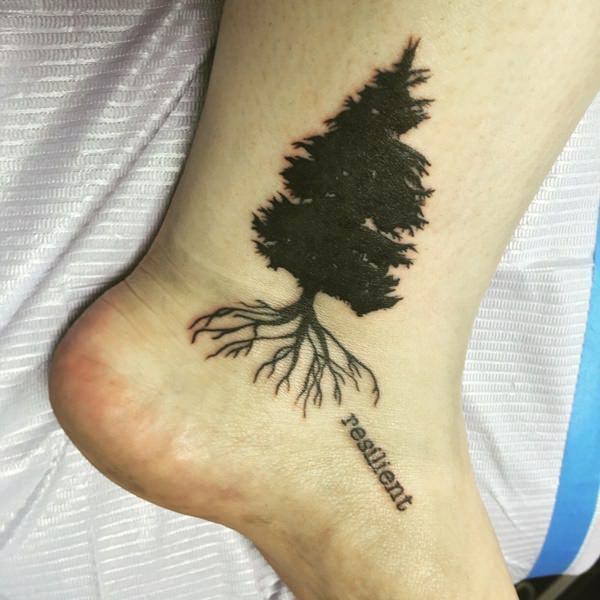 This tattoo, located on the inside of the wearer’s left ankle, displays a liberal use of black ink while retaining detail through a conscious utilization of negative space. Underneath the roots of the tree the word, “resilient,” in a Courier-like font.